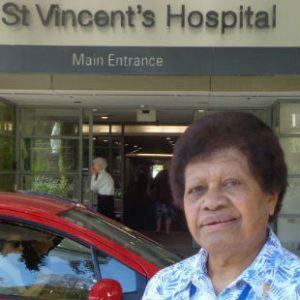 Sr Sesarina Bau has had a long and distinguished career in nursing, a career which began when she began her nursing training at St Vincent’s in Sydney. into St Vincent’s Hospital in Darlinghurst. Sr Sesarina has been in and out of St Vincent’s for more than 50 years, and has worked across a wide range of departments including the surgical ward, the Emergency Department, and plastic surgery. In between those stints, she worked in Thailand and Kampuchea in a relief operation for the International Committee for the Red Cross, and went as part of the team from St Vincent’s to the Solomon Islands to assist with disaster relief in the aftermath of Cyclone Namu which devastated the islands in 1986. Given this range of experience in nursing, did Sr Sesarina ever think about doing medicine? “I did, but by that stage it was too late,” she said. In 1993, Sr Sesarina was in charge of the HIV/AIDS unit at St Vincent’s. The syndrome had been discovered a little more than 10 years before, and understanding of it was still in its early days. “The first day I was in the unit, the patients saw that a nun was coming to look after them, and made certain assumptions about how I felt about them. “They ignored me, and carried on talking among themselves. I did the rounds, and at the end of it, I said to them, I will be back tomorrow. These days, Sr Sesarina is still tackling things head on, now in the Intensive Care Unit, where she works very closely with the nursing staff. She receives initial reports on the patients from them, and then later she works with the doctors. “The other day, one of the patients said “She’s very tough, that nun, but she seems to know what she is doing’,” said Sr Sesarina.